New Lab Setup Program with Proteintech! Proteintech Group offers a generous discount to researchers who are setting up a new lab. Established in 2002 by a group of research scientists, Proteintech Group was founded with the vision of producing the highest quality antibodies. Having produced over 12,000 antibodies thus far, Proteintech is well on its way to producing antibodies for each human expressed gene in the human genome. Over 90% of Proteintech antibodies are raised against the whole recombinant protein. This gives their antibodies superior protein recognition capabilities and versatility. Proteintech uses primary tissues and regular cell lysates to perform all of its validation western blots. 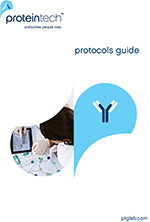 You can be sure that any Proteintech antibody you choose will be successful when they make the transition from validation to experiments. *Terms and Conditions apply. This New Lab discount applies to orders for all pre-made antibodies; custom production services are not included. No minimum purchase is required. There is no limit on the number of orders the customer places in the 3 month period. The 3 month period starts on the day they get their code and finishes exactly 3 calendar months after this date. The New Lab Discount promotion is available in the following countries/regions only: USA, UK and Germany. The discount offered by distributors in these countries/regions may differ to the discount offered by Proteintech. Please contact your local distributor for more information. To qualify for the new lab promotion, your lab must have been opened within the last 12 months.